A state of the art design for a perfect fit to your Ferrari F355. Available for the 2.7 and 5.2 models. 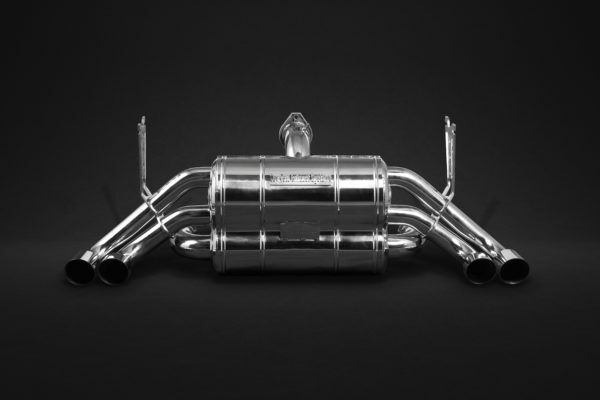 An increase in horsepower and sound results through a more efficient flow of the exhaust system.This exhaust system can be installed directly in the existing mounting points.This Exhaust System developped by CAPRISTO Exhaust, will reflect the true character of your F355. The original design for this system was based purely for enhanced performance and sound, and the systems internals have been designed to increase flow and reflects the true Ferrari F1 sound. Lighter with better heat dissipation, this exhaust offers better performances (better torque and throttle response).Made of T309 (1.4828) Stainless steel (properties close to Inconel)Under certain driving conditions with the original bypass valve in the open position, a reverse flow through the silencer causes overheating and damage to the headers on Ferrari 355 vehicles. Under these conditions, once the exhaust gas valve is open, the exhaust gases do not all flow through the main catalytic converter but mainly through the bypass. 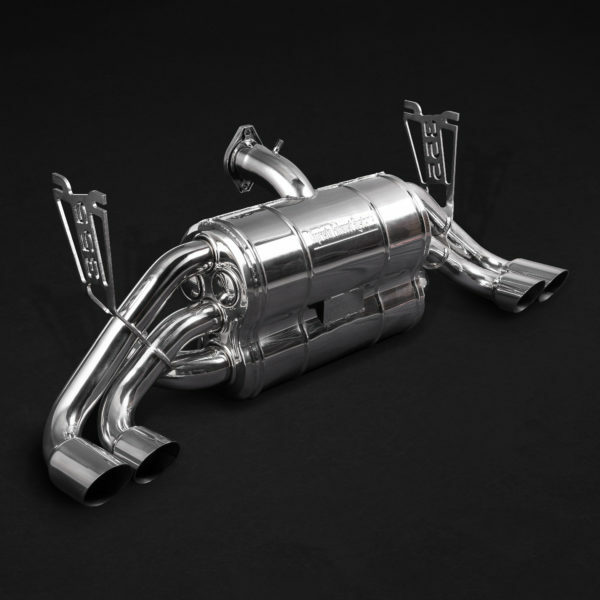 The exhaust gases flow off the exit which leads to the main catalytic converter and generate a vacuum. Thus the hot exhaust gases in the muffler are aspirated backwards through the main catalyst which additionally heats up the gases. Then the gases are guided though the bypass and recirculated by the exhaust gas valve into the muffler again. When the exhaust gas valve is open, this gas flow is circulating ceaselessly generating more and more heat. We are of the opinion that this problem is known to Ferrari. For this reason the F355 was changed since 1996 from engine 2.7 to 5.2 and the headers were modified exactly in the place where the vacuum is generated. But the problem was not eliminated by this measure. Now you can imagine that extreme back pressure is created in a case where all of the exhaust gases coming from the engine and those which are aspirated backwards have to flow through 1 exhaust gas valve. That’s the reason why the F355 does not provide the power as indicated.After some testing it was obvious for us that our theory was right and that the bypass causes this problem. 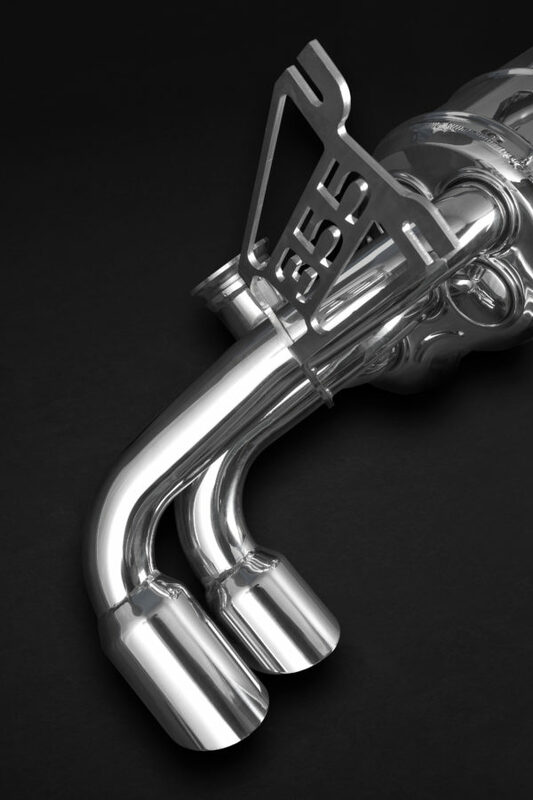 One exhaust gas valve is not sufficient and thus leading to extensive heat due to the back pressure.Our exhaust systems, irrespective of the racing or the usual model, are so designed that the exhaust tubes from the main catalytic converter lead to the outer end pipes and those from the bypass to the inner end pipes. These tubes do not lead to each other. Consequently it is not possible, when the vacuum in the main cat is generated, that hot exhaust gases are recirculated. 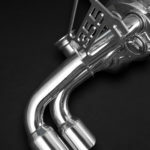 Instead cold air through the outer end pipe is drawn backwards through the catalytic converter and the bypass and the valve. Once cold air is mixed up with hot exhaust gases, the temperature of the exhaust gases decreases and also the temperature of the complete system.The original single bypass valve also did not flow enough gasses at full throttle. 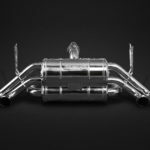 After recognizing this problem, CAPRISTO exhausts set out to eliminate both problems with a new design. This system is available in Sound 1/2/3: of which 3 is the loudest possible and most popular version.